« When you stare into the Boötes void, does the Boötes void also stare into you? Titan’s seasons change slowly: each year lasts 29.5 Earth years, so each season is more than 7 Earth years long. The moon is tidally-locked, presenting the same face to Saturn all the time, just like Earth’s Moon does, and it orbits very close to Saturn’s equator. That ties its seasons to Saturn’s: when the planet is in summer, so is Titan. So summer has arrived in Titan’s northern hemisphere, but its weather is not changing quite as expected. For one thing, the moon has been nearly cloudless for years, when (according to computer simulations) the summer storms should have begun. That’s why the formation of a cloud bank over the methane lake Ligeia Mare is exciting, as I explained for The Daily Beast. Cloud watching is important. 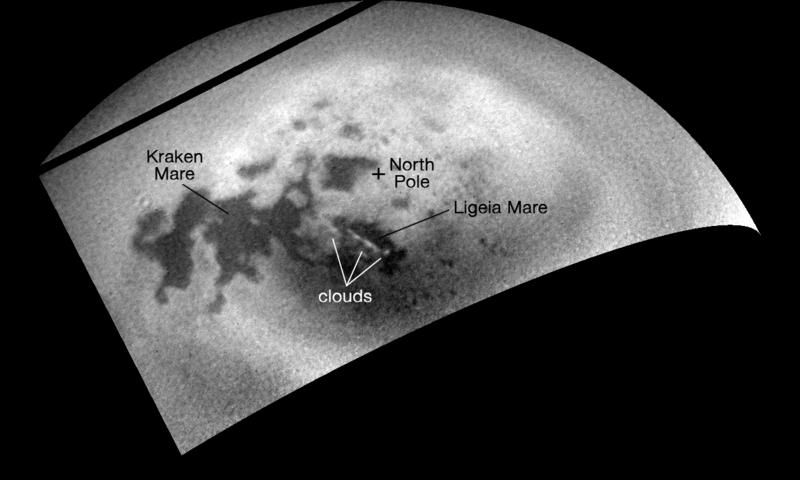 Clouds carry material—water on Earth, methane on Titan—from one part of the atmosphere to another. They’re a way a world carries liquid from one region to another, in the form of evaporation and rain. A lake may dry up in one region, but a new one can form when rains fill a basin elsewhere. We know very well how that process works on Earth, but Titan’s weather is still mysterious in many ways. The Cassini team also put together a short video loop, showing the cloud bank forming, moving, and dissipating.